At the age of 14 I got my first guitar, a cheap Yamaha electric and bad Peavy amp. Typical beginner equipment, easy to return if the kid gives up after a month. 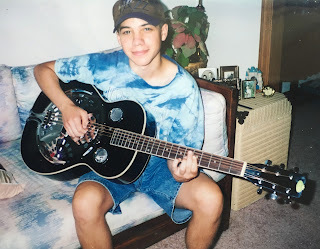 Well, 2 months later I had a Les Paul - just happened to see a cheap used one at the guitar store and my music-loving parents could see I was hooked. Typically if a kid wants to go acoustic, they get a regular acoustic guitar. I got a Regal Dobro. I loved the sound of Duane Allman dobro's on "Little Martha" and "Please Be With Me" and Dickey Betts on "Pony Boy", so I just had to have one. I didn't have it for long, the cones started buzzing, which happens as seasons change. But I thought it was broken, so I returned it for a Marshall Amp. It would take 20 years before I replaced the dobro, and damn am I glad to have another one.